The publisher talks about ANTIBOOKCLUB. Gabriel Levinson just wants to talk to you. He wants to talk to you about what books you’re reading, the cover design of Haruki Murakami’s 1Q84, the superiority of printed books over the Kindle. In fact, he may have already talked to you, maybe a few summers ago in Millennium Park as the guy behind the Book Bike, a DIY bookmobile that gives away books and has, for the past four years, become a seasonal fixture in Chicago’s parks. 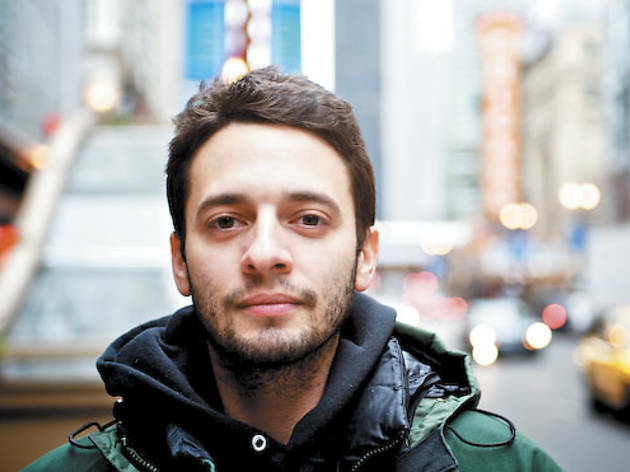 Or more recently, he may have talked to you as a street peddler outside the Apple Store on Michigan Ave, spreading the word about ANTIBOOKCLUB, an independent press he founded in 2010. In this case, he was selling the press’s first release, a handsomely designed fiction anthology called A Brief History of Authoterrorism that includes contributions from the late American satirist Terry Southern and New Yorker editor Ben Greenman. Until the Chicago cold shut him down, Levinson could often be found on his lunch hour and on weekends, armed with little more than a street peddler’s license and a homemade T-shirt that read, in black Sharpie, i’m an indie publisher. please buy my books. “As you can tell from that shirt, there’s no money in advertising for me,” Levinson says. “It’s really all word of mouth.” But in a way, street peddling has allowed him to keep doing what he’s loved about Book Bike: talking to people. And if he’s learned anything from his first venture, it’s to never underestimate the power of person-to-person interaction. “I do strongly believe that personal connection does matter very much, and that’s something we can’t get through social media.” It’s not surprising then, that Levinson estimates that 99 percent of pedestrians who stop him on the street will buy a book. 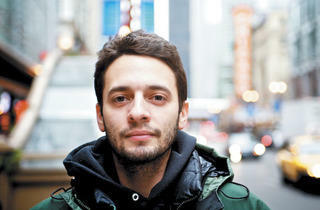 Levinson, 29, keeps things in perspective: He’s a new publisher who’s still learning the ins and outs of the business. This spring, ANTIBOOKCLUB will come out with its second release, The Diesel, a novella by Emirati writer Thani Al-Suwaidi. Originally published in Beirut in 1994, and in subsequent editions throughout the Middle East, it’s a controversial work narrated by a transgender protagonist. The publication of The Diesel, which will be in its first English translation, is also an indication of ANTIBOOKCLUB’s editorial focus on international authors overlooked in the English market. Coinciding with the release of The Diesel, Levinson is making some personal changes. He’s moving out of Chicago, the place that has incubated his wildest ideas for the past decade, and heading for the warmer climes of Austin, Texas, which he says has friendlier policies toward small businesses. He’s not sure if he’ll take up street peddling in Texas, but he’s hoping to keep the emphasis on personal connection in his business. A Brief History of Authoterrorism is available on antibookclub.com.